style="text-align:center;"> Please note that this topic has not had any new posts for the last 296 days. Hi everyone, love the website, long time lurker.. 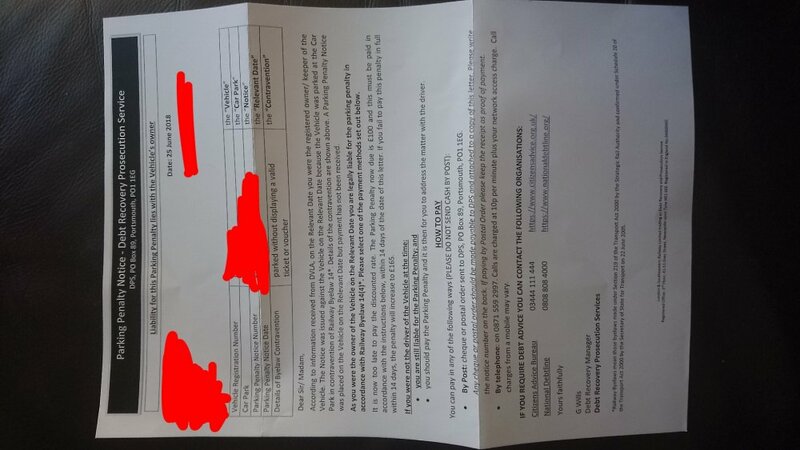 I received a lovely yellow penalty notice stuck to my window today. I have attached the 'ticket' in this post. From what I understand I should not do anything until i'm sent a notice to keeper, is that correct? And then from there I'm a bit unsure, so any guidance would be greatly appreciated! Hello and welcome to CAG. Would it be possible to put your documents into a single pdf file please? That way we can read them easily. Our upload guide will help you. Correct. Await the NTK before doing anything further. Sorry! Thanks for doing that. I will update when i hear more! so, did you fail to display a ticket? Was there such a term specified on the signage at the place you parked? knowing these will help us advise you when you do get a letter through the post. Tell us exactly when that arrives as dates are critical. It was the railway car park so I assume that it is railway land? Thanks for your help, and yes I will do! 1 The date of infringement? Did the NTK provide photographic evidence? did the parking company give you any information regarding the further appeals process? 5 Who is the parking company? 6. where exactly [Carpark name and town] did you park? so you wait for the letter through the post and then you tell us the exact date you received it. until then you just get piccies of the signage and the location of your vehicle at the time. Hi all, so I received the attached letter today (26/06/18) from the event on 11/04/18. Pdf please and upright too!! So outside of 29 - 56 days fron 11/04? Not that I don't believe you, but is there somewhere I should look to see this? Pardon my ignorance...but link page 9? Also, is it worth going the POPLA appeal route to stop any future letters being delivered? dx, they are claiming this as a "penalty charge", rather than a " parking charge". They've only got a certain amount of time to take you to Magistrates court (not as scary as it sounds, it won't involve a criminal record, even if they did, and you lost) so, it's time to have some fun with these clowns. But we need some more information, and fairly quickly as you need to respond to that letter before their arbitrary deadline. Can you get back down to the railway station and take pictures (including close ups, so that we can read the small print) of every sign that has absolutely anything to do with parking. (obviously I don't mean a dozen pictures of different signs that all say exactly the same thing) but any sign that has something, even slightly, different written on it. Please note that my posts are my opinion only and should not be taken as any kind of legal advice. indigo cant do court on a penalty charge notice as the money wouldn't goto them nor the railway co but the magistrates. bottom of that sign says indigo and clamping!! oppss!! How long have they given you to send the form back? The statutory period is seven days but many EA's give you more. Just some basic things about CTax bailiffs you probably already know. They have no powers to force entry, however, they can gain access through an unlocked door or take goods from the garden. They can call on any day of the year between 6 am and 9 pm. If the Bailiff does not collect, and the warrant is returned to the council all fees will disappear and you will be left with just the original debt. So if you did nothing and you are happy for the threat of the Bailiff calling for up to twelve months you could just "sit it out" and eventually you may get away with just paying the council the original debt without fees. Many subscribe to this course of action. The downside is, for the period mentioned there is the continual threat of the bailiff calling and all the stress that goes with it. in addition most importantly, the authority, on the return of the warrant may just pass it to another bailiff. So perhaps over the weekend, you could decide which path you want to pursue. I don't want to persuade you either way but personally, I would rather just get it sorted, (With the authority if possible) and get on with the important stuff in my life :). Bought a car for £350, drove it home with insurance and MOT, but no tax. Parked it outside the house while someone else was taxing it, however the other person (who was to borrow the car for a few weeks) mixed up some log books and taxed the wrong car. 5 hours later, private company came around, picked up the car and took it 20 miles away into London (as opposed to the local inpound 2 or 3 miles away). Didn't realise it was gone until the morning, called 101 and confirmed it was taken for no tax. Called impound, they want £260 to release it, said I had half hour to pick it up or it goes up another £100. My fault 100%, shouldn't have parked it without tax on the road. Now, it wasn't parked dangerously, it wasn't abandoned. Should it have only been clamped first? I'd pay the £100 DVLA fee but the car isn't worth getting back for £360. Just seems sneaky that a private company took it, and transported it 20 miles away into London (it would take an hour and a half each way at least).